We are an easy bike ride to the Social Security and CMS federal offices just out Security Blvd. 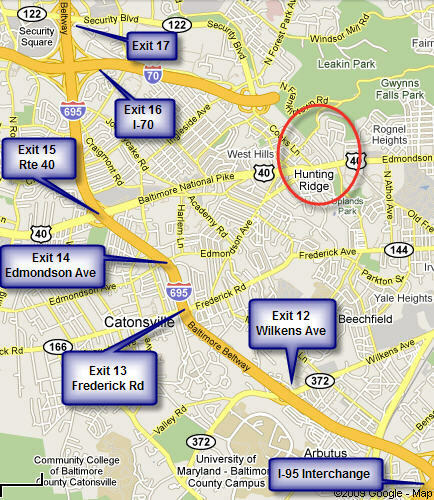 Biking to the Catonsville area is also easily done. One can also get to the downtown area by way of the Gwynns Falls Trail. Since we're on a major east-west thoroughfare into Baltimore city, there are many places to catch a bus. Refer to the MTA website for schedule and routes. Commuting by car from Hunting Ridge to just about anywhere is much easier than from other parts of the city. This is because we are centrally located to many different on the Baltimore Beltway, I-70, and I-95. Driving into downtown is a straight shot down Route 40, and one can also get to the JFX and parts of northern Baltimore City without hitting the traffic heading to downtown. There are many ways to do this. Many in Hunting Ridge commute DC on the MARC train. There are also buses from the Columbia area that go to Silver Spring and down to the Mall.